With cruise control, you can set and automatically maintain any speed of more than about 25 mph (40 km/h). 1. Push in the cruise control main switch. This turns the system on. 2. Accelerate to desired cruising speed above 25 mph (40 km/h). 3. Push the “COAST/SET” control switch and release it. The "CRUISE" indicator light in the instrument cluster will illuminate after you have set the vehicle speed at the desired speed. 4. Remove your foot from the accelerator pedal and the desired speed will automatically be maintained. 5. To increase speed, temporarily depress the accelerator pedal enough for the vehicle to exceed the preset speed. When you remove your foot from the accelerator pedal, the vehicle will return to the speed you have set. Depress the clutch pedal (Manual transaxle). 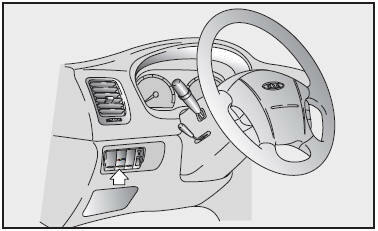 Shift the shift lever to “N” position (Automatic transaxle). 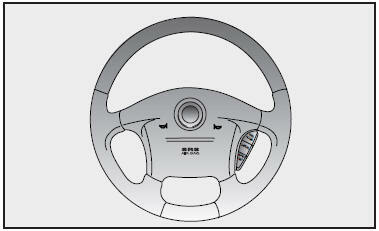 Depress the CANCEL switch located on the steering wheel. Decrease the vehicle speed lower than memorized speed by 12 mph (20 km/h). Decrease the vehicle speed approximately to less than 25 mph (40 km/h).